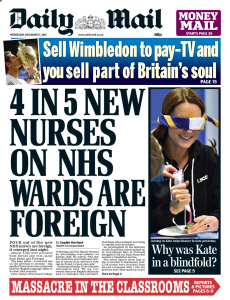 In fact, the truth is that 4 in 5 new nurses on NHS wards are British. who cares anyway its not like you an send a nurse bak home. and if your ill you care what country yours comes from. Would that be same Paul Dacre who chairs the Press Complaints Commission? WildSwimmerPete: Dacre’s too clever to chair the commission itself. He chairs the Editors Code of Practice which the Independent Press Standards Organisation uses to police complaints. The IPSO is a front – a kind of smokescreen to hide the fact that Dacre et al still oversee press complaints. Conclusive evidence once more that the Daily Mail really does print nothing but racist and anti-working class propaganda. It really is amazing that Paul Dacre occupies the position he does in the Press Complaints Committee. It’s like getting Goebbels to police the German media during the Third Reich. The DM is no more than a rag and is only ideal for us poor sick and disabled to wipe our arses oni certainly don’t believe a single word that they ever print. The Daily Mail has no regard for the truth, it’s a disgusting newspaper, except to describe it as Newspaper is wrong. There’s rarely much factual news in it. By “Foreign” I interpreted it to mean UK Born wildthing666. As far as I know Christianity, Islam and Hindu aren’t actually countries, but it’s entirely possible that the Daily Mail “readers” don’t know this. One can criticise wildthing666’s language, but the question remains. What does “foreign” mean? The Daily Mail doesn’t say, and nor does Tom Pride, so both are actually playing the same racist misinformation game. sidthemanager – I’m not sure if you made a Freudian slip by saying “UK Born” rather than “not UK Born”! Even so that’s wrong. For instance, are the people who moved to the UK from the West Indies and elsewhere in the 1950s still ‘foreign’ in your opinion? Problem is..we are still all hooked up on colour! I love colour and languages… Oh!… and different food besides rost bif! There is an exception….. I as a woman would draw the line at the niqab… chuck the bloody thing.It is a gross insult to women! Foreign or wot? Rrrraaaa……. Tom – “Employed from overseas” is a laughable definition! Does it include people employed from overseas 40 years ago? I see, so a nurse employed from overseas on 31 August 2013 is ‘British’ and a similar nurse employed a day later is ‘foreign’. I’m so glad you’re in full agreement with these wonderful government statistics and you were able to explain them to a poor fool like me. The point is (as I said in my first message) – “What does “foreign” mean? The Daily Mail doesn’t say, and nor does Tom Pride”. Apparently you think “foreign” means only people employed from overseas after 31 August 2013. Is that correct? Personally I think the term is meaningless and therefore both the Daily Mail and you are (as I said) “…actually playing the same racist misinformation game”. I guess the simple maths is lost on you. Far more than 20% of nurses currently working in the NHS were not British citizens AT THE TIME they were were recruited (i.e. “new nurses” applies to more than just the last year). Most subsequently became British citizens by virtue of their employment, so the government numbers are (deliberately?) misleading. I doubt that it’s as high 80%, so the Daily Mail is wrong too. Would you agree? If you didn’t think that both your readership and the Daily Mail’s would inevitably see this in racial terms then it’s you who’s thick, and you also clearly haven’t bothered to read many other posts on your site, and on this page in particular. The important statistic is what proportion of nurses (and doctors) were trained outside the UK, and what skills they consequently have (medical, language and cultural). The ‘British’ or ‘foreign’ label is a deliberately provocative and disingenuous point, and I think you (and the Daily mail) knew it when you used it, hence my comment about racist misinformation games. [Oh for heaven’s sake, you’re getting silly now. There is nothing racist about saying someone is foreign in the UK if they don’t have British nationality. It’s just a fact. For example, I don’t have Spanish nationality, which means I am a foreigner when I visit Spain. WTF is ‘racist’ about stating that? 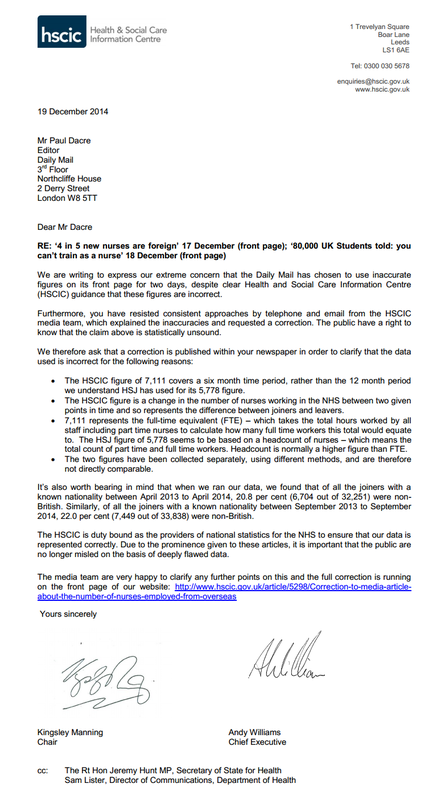 BTW – When you said “statistics which were measuring the % of new nurses from overseas who were working in the NHS between 2013 and 2014” that’s very definitely wrong. The figures were NOT concerning nurses “working in the NHS”, they relate only to new “joiners”. Also, did you know that in 2001/2002 for the first time ever there were more overseas additions to the RCN register than from the UK? I say that the Daily Mail numbers are wrong and they’re probably guilty of trying to provoke a racist response, and you think I’m defending them? I didn’t say that using the word ‘foreign’ is intrinsically racist, but that it’s deliberately provocative and disingenuous in this context. The Daily Mail is playing a racist misinformation game, and to join in that misinformation game on the government side helps to condone it.